An abandoned Romanesque Revival heritage church in Montreal has been transformed into the beautiful Bourgie Concert Hall. 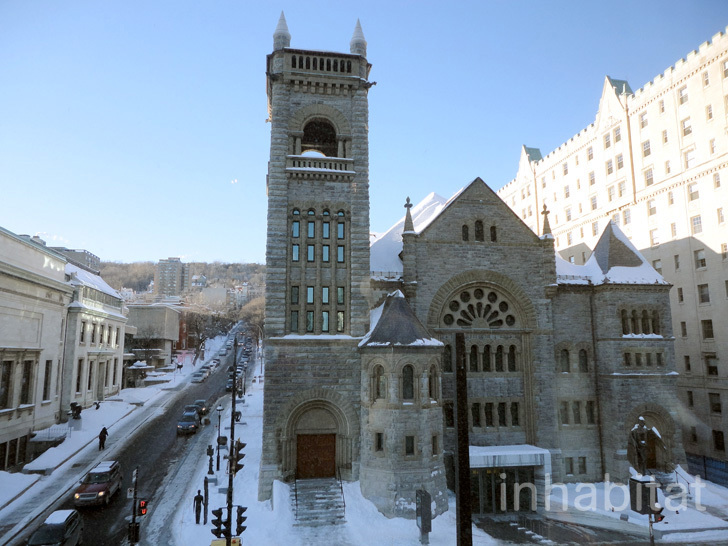 When the historic church adjacent to Montreal’s Museum of Fine Art came up for sale, the museum decided to preserve the architectural culture of the area and bought the building as part of an extensive museum expansion. The adaptive reuse project has not only maintained the church’s façade, but also the 18 rare Tiffany glass stained windows that adorn each side of the building. Provencher Roy + Associés Architects headed the redesign of the historic church that was originally designed and built by Alexander C. Hutchinson in 1894. With the church preservation at the heart of the museum’s expansion, the nave of the church has been repurposed into the Bourgie Concert Hall. 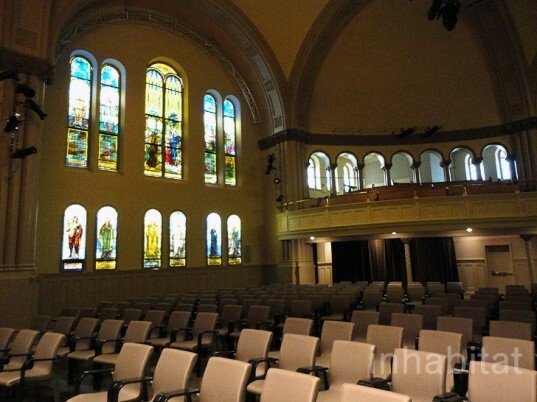 The new hall will host 120 concerts programmed by Arte Musica Foundation, and visitors can marvel at the Tiffany stained glass during performances. The glass is not only beautiful, but extremely rare, as Tiffany’s religious themed glass is uncommon in Canada. Inside the former nave, comfortable removable chairs make up the auditorium seating, which can be easily removed to also accommodate special events or parties. The balcony still sports the original church pews, which were designed in undulating curves, and have since been updated with ergonomic back supports for comfort. With the historic interior preserved, the Bourgie Hall is a unique setting to experience a concert. The expansion and renovation extended the museum’s exhibition space by 59,000 square feet, adding a five storey building to the back of the existing church. The feeling that there is a link between fine art and chamber music strengthens their program, and this feeling is further underscored by the museum’s audio guides that play music from the era in which a room’s paintings were created. Thanks to the expansion, which holds the museums works by Canadian artists, the museum can exhibit 11% of its collection, as opposed to just the 5% prior. The Bourgie Hall and new addition are connected to the museum’s main building across the street through an underground passage way, which showcases the museum’s collection of large scale works by Canadian artists. Both the museum and city benefited from the incredible adaptive reuse, setting a standard for salvaging the historic churches of Montreal. Provencher Roy + Associés Architects headed the redesign of the historic church that was originally designed and built by Alexander C. Hutchinson in 1894. With the church preservation at the heart of the museum’s expansion, the nave of the church has been repurposed into the Bourgie Concert Hall, which will host 120 concerts programmed by Arte Musica Foundation. Visitors can marvel at the Tiffany stained glass panels during performances, which are not only beautiful, but extremely rare, as Tiffany was not prone to creating religious themed glass. Inside the former nave, comfortable removable chairs make up the auditorium seating, which can be easily removed to accommodate special events or parties as well. The balcony still sports the original church pews, which were designed in undulating curves, and have been updated with ergonomic back supports for comfort. With the historic interior preserved, the Bourgie Hall is a unique setting to experience a concert. The expansion and renovation extended the museum’s exhibition space by 59,000 square feet, adding a five storey building to the back of the existing church. The feeling that there is a link between fine art and chamber music strengthens their program, and this feeling is further underscored by the museum’s audio guides that play music from the era in which a room’s paintings were created. Thanks to the expansion, which holds the museums works by Canadian artists, the museum can exhibit 11% of its collection, as opposed to just the 5% prior. The Bourgie Hall and new addition are connected to the museum’s main building across the street through an underground passage way, which showcases the museum’s collection of large scale works by Canadian artists. Both the museum and city benefited from the incredible adaptive reuse, setting a standard for salvaging the historic churches of Montreal.